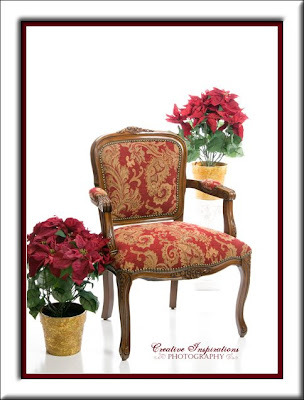 I just bought a new pretty chair to use for a prop, and the color matches Christmas and the holiday season wonderfully. 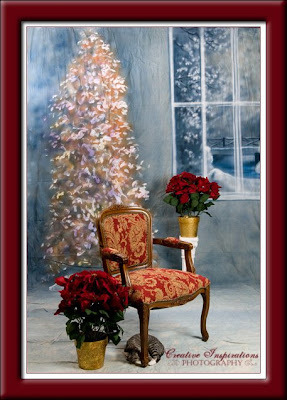 Here are two possible sets to use, one is the white High Key, and the other is the new Christmas backdrop. We can certainly change things around, and you are not required to stay with just that arrangement. I'll be posting some high key of a little one done today. Please let me know which set you would like, if scheduling an appt...it's so much easier knowing ahead of time what props I need to get out! PS: the kitten is not part of the props, and won't be in your pictures! And the wrinkles will be gone before you know it! I love your chair!!! Where did you find it? This is going to be a great set for you. I look forward to seeing your Christmas shots with this new set.